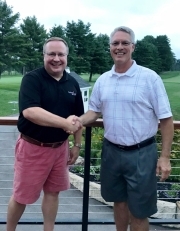 LRGHealthcare President & CEO Kevin Donovan (left) thanks Bank of New Hampshire President & CEO Paul Falvey for the bank’s generous support as Presenting Sponsor for a 10th year of the LRGHealthcare Golf Classic. Held at Laconia Country Club, the event raised nearly $48,000 to be utilized for renovations to the Emergency Department at Lakes Region General Hospital. LACONIA, NH – The LRGHealthcare Golf Classic, held on Monday, August 13 at Laconia Country Club, was a great success raising $47,958 for renovations to the Emergency Department at Lakes Region General Hospital. Two flights of golfers took part, choosing to play in the morning or afternoon. Each round was followed by a delicious meal courtesy of the LCC culinary team, a short program, and prizes for top golf teams. 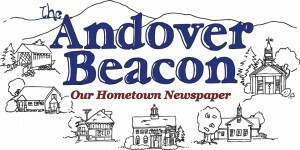 The day was also an opportunity to celebrate Bank of New Hampshire’s 10th year as Presenting Sponsor. “Monday’s Golf Classic was another fun and successful day with a really great group of supporters,” states LRGHealthcare President & CEO Kevin Donovan. “Funds raised from this event will be utilized towards renovations to the Emergency Department at LRGH, which thanks to some extremely supportive donors is scheduled to start this fall. I’d like to extend my gratitude to everyone who sponsored or supported the Golf Classic in any way,” adds Donovan. Presenting Sponsor Bank of New Hampshire was joined by several high-level sponsors including Gold Sponsor DiGiorgio Associates Inc./Monitor Builders Inc., LiRo Group Companies; Silver Sponsors Brennan & Pike and Cross Insurance Agency; Driving Range Sponsor Consolidated Communications; Golf Ball Sponsors Atlantic Broadband, Giguere Electric, Inc., Nixon Peabody LLP, and Pepsi Co.; Bronze Sponsors Cerner Corporation and FirstLight; and Cart Sponsors Martin Technical Services and Tufts Health Freedom Plan. Corporate Sponsors included: Advanced Orthopaedic Specialists; All Metals Industries, Inc.; Bay Point Financial, LLC; Belknap Landscape Co., Inc.; BerryDunn; Golden View Health Care Center; Gragil Associates, Inc.; HVAC Unlimited; Kaufman Hall; Lacewood Group, Inc.; MB Tractor & Equipment; Melcher & Prescott Insurance; Mercer, Meredith Village Savings Bank; Stanley Elevator; Stewart’s Ambulance Service; and WBS/HUB International New England. The LRGHealthcare Golf Classic featured Hole-in-One contests courtesy of Fratello’s Italian Grill, Dr. Paul F. Racicot and Family, and the Irwin Automotive Group. More than a hundred businesses, thirty volunteers, and two flights of golfers came out to support this year’s LRGHealthcare Golf Classic. To be added to the 2019 mailing list for the LRGHealthcare Golf Classic, or to make a gift to LRGHealthcare, please contact Becky Doherty: 603-527-7063 or email: rdoherty@nulllrgh.org.